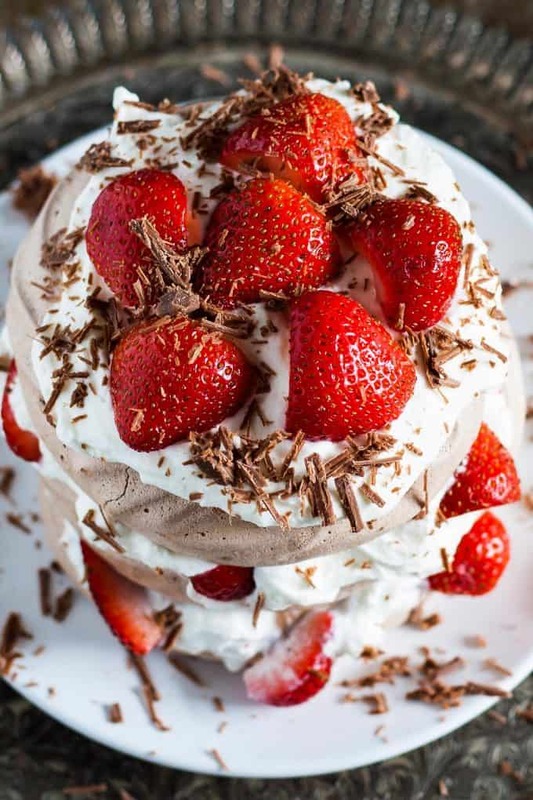 This chocolate pavlova cake is made with chocolate meringue, whipped cream and fresh strawberries. This is the easiest fancy dessert recipe ever! Sometimes a girl wants to eat cake and she wants it to be glorious. 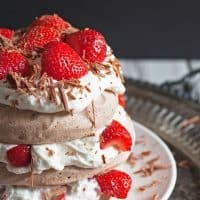 My chocolate pavlova cake is just the glorious cake to make that girl happy (I’m talking about me, in case you were wondering). 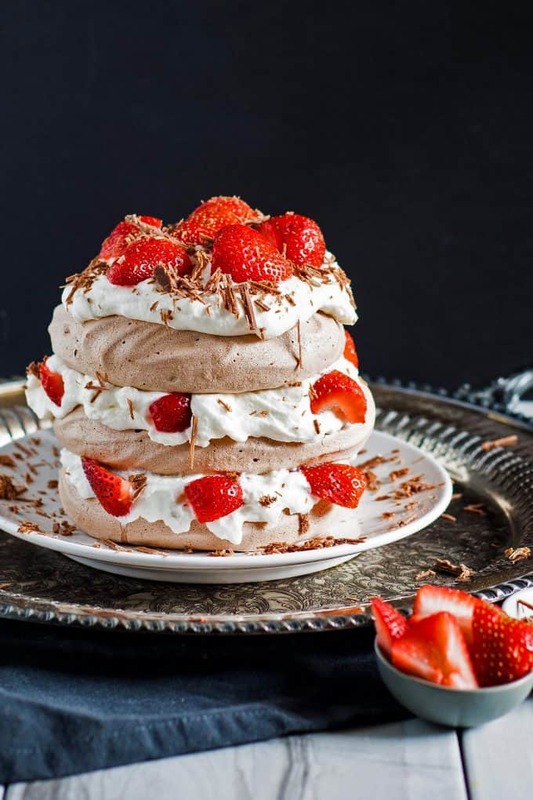 Three delicious chocolate meringues are layered with sweet whipped cream and strawberry chunks – you will be so glad this cake is all yours so you can go back for seconds. If you have yet to make a pavlova, the meringue part can be a little intimidating. I had this pavlova idea in my head for months before I finally got the courage to make it. This recipe makes enough for 6 small meringues, so 2 cakes. One of the reasons I like it so much is you don’t have to be perfect. Haphazardly placing the strawberries and sprinkling chocolate on top is half of what makes this cake so fun, and so glorious. Get the meringue in the oven and then go about your day. I have been known to leave the meringue in the oven during the cooling portion (when you let them sit in the oven) for several hours. When I am ready to assemble my cake, I whip up my cream and then I am good to go! Be careful as you arrange your cake because the meringues may sink a little from the weight of the toppings and layers. When cutting into pieces, use your non-cutting hand to leverage the cake so it doesn’t slide all over the place. Or you could do what we do… a few forks or spoons and we all dig in! 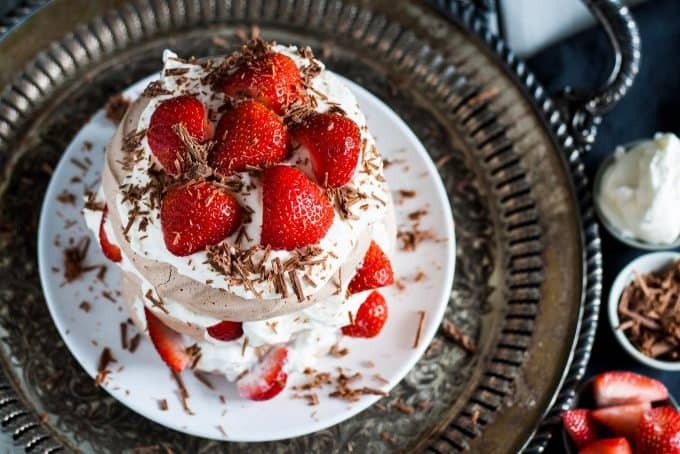 This chocolate pavlova cake is made with chocolate meringue, whipped cream and fresh strawberries. This is the fanciest easy dessert recipe ever! Preheat your oven to 250 degrees F. Line a baking/cookie sheet with parchment paper. In the bowl of a stand mixer with the whisk attachment, beat the egg whites and granulated sugar on high, until stiff peaks form. Add the cocoa powder, corn starch, lemon juice and vanilla extract and mix until well blended. Transfer to your lined sheet. Use a spatula to make 6 round rings. Make sure there is an indent in the center of each circle - the centers will rise during baking. Bake for 1 hour and 30 minutes. Turn off the oven and allow the meringues to cool in the oven with the door closed for at least 1 hour. When you remove them from the oven, make sure they are completely cool before assembling your pavlova cake. Beat the whipping cream on high for 3-4 minutes. Slowly add the powdered sugar until the whipped cream is thick and fluffy. When you are ready to serve, assemble your cake. Place one meringue on a plate. Top that with whipped cream and repeat until you have used 3 of your meringues. 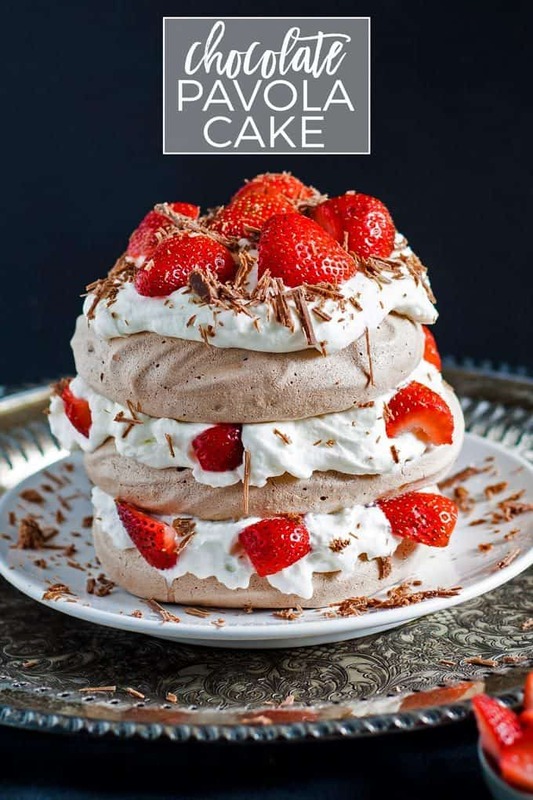 Place several strawberry chunks into the whipped cream and on top of the cake. Sprinkle chocolate shavings on top. Looking for more fun chocolate desserts? Try this boozy bourbon chocolate shake or these s’mores brownies! What an amazing cake! Thanks for linking up to Merry Monday! Sharing on FB Wednesday! ! Have a great week! I love chocolate pavlova! 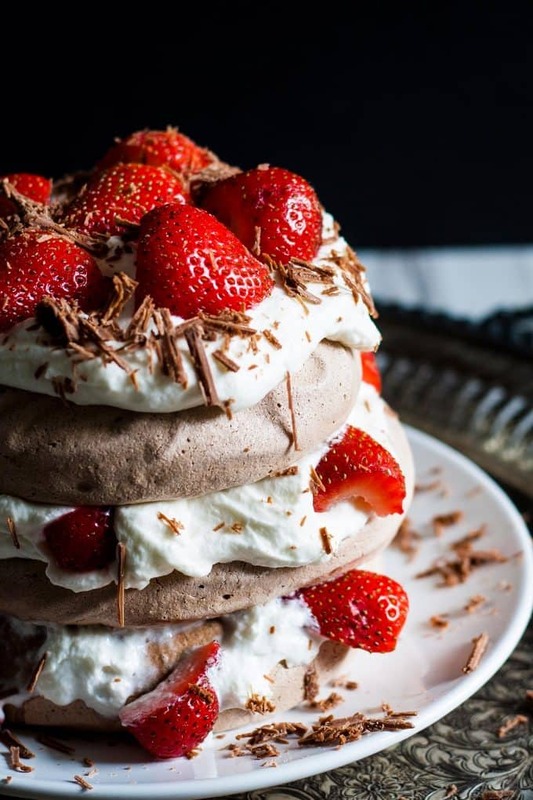 I’ve never stacked them before—what an impressive, elegant and delicious dessert! Not only does this have to be delicious but it’s one of the prettiest cakes I’ve seen! I have never made a pavlova. It is gorgeous. Absolutely amazing!! My daughter is a big pavlova fan, and I have to admit I haven’t made it in ages. I think I’m going to surprise her! I hope you both like it Kim!! I love light desserts like this that have all the delicious chocolate flavor without filling you up. Gorgeous photos! Almost too pretty to eat! How pretty is this? I’ve never made pavlova and only in recent years discovered that I actually do like meringue, so long as it is fresh. I need to try this one of these days. Thank you Erin! Fresh meringue is delish!! This is one gorgeous cake, Jenny! 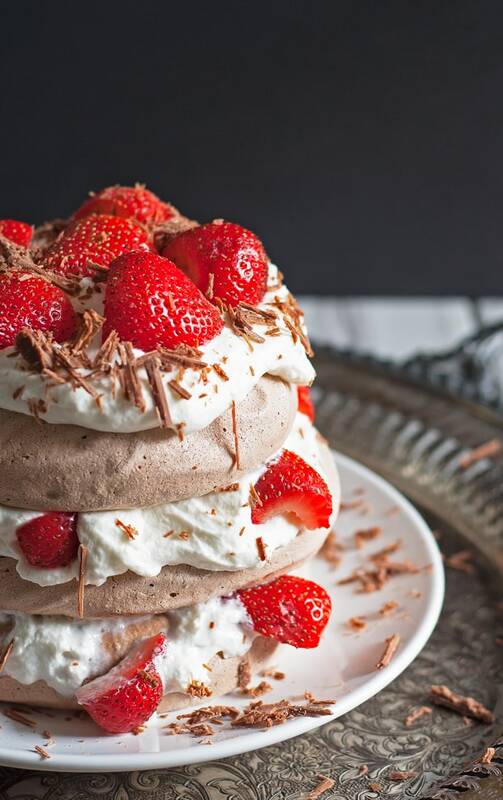 I love all of those light, chocolatey layers and the strawberries, too! These are so pretty! Thanks for linking up with What’s Cookin’ Wednesday! I LOVE making Pavlovas. This is beautiful! Happy I saw your recipe at Let’s Get Real Friday Party. Have a great weekend. Thank you Emily! I hope you had a great weekend! Wow, what a stunning presentation!. It looks seriously amazing!